Here is the list of top players with most runs in IPL 2019 and orange cap holder of ipl 2019. Here is the list of top players with most wickets in IPL 2019 and purple cap holder of ipl 2019. Here are IPL 2019 centuries list. 100th t-20 half century by Chris Gayle in 28th match, most by any batsman in the world. 100th win as Captain for MS Dhoni in IPL and first to do so. First team to register 100 win – Mumbai Indians. CSK bowler Deepak Chahar creates IPL record with 20 dot balls vs KKR in an inning. Chris Gayle hits 300 sixes in IPL. Best bowling figures on IPL debut : Alzarri Joseph (3.4-1-12-6). 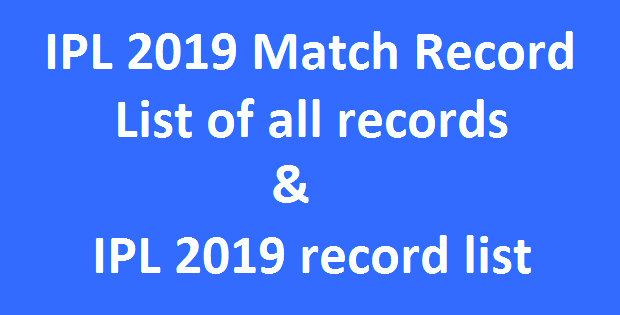 We are listing here IPL match record 2019, latest ipl match record 2019, match by match records made and broken in the tournament. Have a look on each match record here of IPL 2019. 1st – Jonny Bairstow completes his first half century of IPL 2019. 16 – Mumbai won 16th match against RCB, most by any team against them. 1000 – Chris Lynn completes 1000 runs in IPL. 100 – Half century number 100 for Chris Gayle in t-20 cricket, most fifty in t-20 cricket. 1 – 1st win of the season for RCB. 200th t-20 match for Mumbai Indians, first team to play 200 matches. 1st win for Delhi Capitals since 2012. 97 – Shikhar Dhawan scored his highest IPL score. 2 – 2nd IPL fifty for Shubman Gill. 100 – Ravindra Jadeja takes his 100th wicket in IPL. 100 – MS Dhoni won record 100 matches as Captain in IPL. 1 – Lokesh Rahul registers his maiden century in IPL. Mumbai Indians highest ever successful run chase at home in IPL. 20 – Deepak Chahar sets record for most dot balls in an inning. 10 – Consecutive win for CSK at home ground Chennai. 49 – Slowest half century in 49 balls for David Warner in IPL. 7 vs KXIP (2015-19) – David Warner equals his own record of most consecutive 50+ scores vs a team in IPL : 7 vs RCB (2014-16). 6 defeat in a row for RCB. It was most consecutive losses at the start of a season for any team in IPL. In 2013 Delhi Capitals (then Delhi Daredevils) also lost 6 consecutive losses at the start of a season. SRH registers their lowest IPL total : 96 runs all-out. Alzarri Joseph registers best bowling figures in IPL as well as best bowling figures on IPL debut (3.4-1-12-6). Sarfaraz Khan registers his first IPL fifty. 16th time RCB scores total of 200-plus runs. Mumbai Indians becomes first team in IPL to register 100 win. Lasith Malinga takes most wickets vs CSK in IPL : 26 wickets. MS Dhoni completes 4000 runs in IPL. 4th consecutive losses for RCB from the start of a season. Delhi Capitals lost 7 wickets in 8 runs from 144-3 to 152-10, worst 7 wicket collapses in IPL. Sam Curran takes first hat-trick of IPL 2019. Sanju Samson becomes youngest player to complete 2000 IPL runs at the age of 24 years, 140 days. MS Dhoni completes his second highest score in IPL (75 runs). Highest total for SRH in IPL : 231 vs RCB. At the age of 16 years and 157 days Prayas Ray Barman becomes youngest debutante in IPL history. Previous youngest debutantes were Mujeeb-ur-Rahman (17y & 11d), Sarfaraz Khan (17y & 177d), Pradeep Sangwan (17y & 179d) and Washington Sundar (17y & 199d). David Warner & Johnny Bairstow becomes the first pair to score three consecutive 100+ partnerships in IPL. Jonny Bairstow registers first 50+ score as century in the IPL. First Super Over of IPL 2019. Lowest ever (10 runs) IPL super-over defended by a team. Andre Russell completes his second fastest IPL 50 in 23 balls. Chris Gayle completes 300 IPL sixes. Quinton de Kock completes 1000 IPL runs. 198 – This is SRH’s highest successful run chase in the history of IPL. Virat Kohli completes 5000 IPL runs. Y Chahal completes 50 wickets at the M. Chinnaswamy Stadium, Bengaluru, first to do so. Most sixes in an IPL match at the Eden Gardens – 24 – KKR (17) and KXIP (7). Today Sunil Narine played his 100th IPL match. MS Dhoni becomes second player in the list of most sixes in IPL (187 sixes) after Chris Gayle (296 sixes). Chris Gayle completes 4000 IPL runs and is fastest to complete 4000 runs (112 inning). He is the ninth player overall & second overseas player to 4000 IPL runs after David Warner (4099 runs). Delhi Capitals have won their IPL opening game for the first time since 2013. Rishabh Pant completes his half century in just 18 balls. Nithish Rana completes his 6th IPL fifty. 7 consecutive wins vs RCB (2014-19) in IPL. Suresh Raina becomes the first player to score 5000 runs in IPL. Harbhajan Singh now has most (11) caught & bowled dismissals in IPL.